Fri, Mar 16, 2018, 10:22 pm SL Time, ColomboPage News Desk, Sri Lanka. 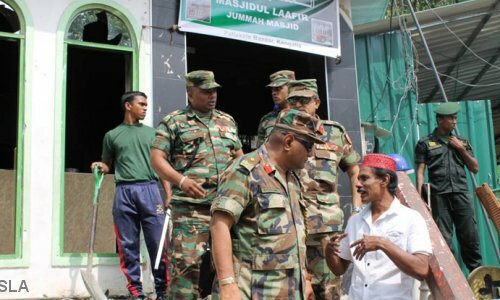 Mar 16, Colombo: The Sri Lanka Army has submitted a report to the Government regarding the current situation in the Kandy district after anti-Muslim attacks by Sinhalese mob devastated the central hill capital and the suburbs. Military spokesman Brigadier Sumith Atapattu says currently the situation in the district is peaceful and the army will continue to report to the government on the conditions. The report has stated that while the current situation in Kandy is peaceful, military personnel should continue to remain in the area. The decision has been made based on the information received from the people of Kandy, the military intelligence and information received from the military commanders in Kandy. Accordingly, the Army is planning to withdraw the military from the district as soon as possible, Military Spokesperson Brigadier Sumith Atapattu told the media. 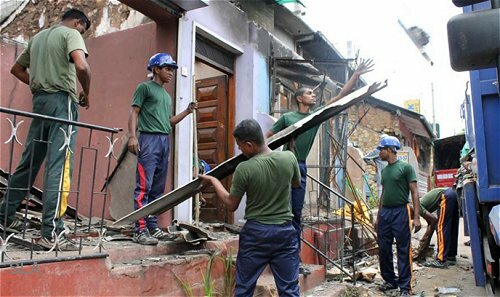 Meanwhile, the Army troops of the Security Force Headquarters, Central (SFHQ-Cen), have been entrusted with the task of rebuilding and renovating all damaged properties in the affected areas of Digana, Akurana, Galaha, Katugastota, Menikhinna, Ambetenna, Poojapitiya and a few other places in the Kandy district. The troops formally commenced clean-up work on both sides of Kandy- Mahiyangana road this morning (16). More than 250 Army personnel, including officers Friday (16) morning, commenced collecting and piling up of debris and other paraphernalia of damaged properties, burnt remnants, etc., the Army said. SFHQ-Cen troops in close coordination with several monks in the area and officials at the Kundasale Divisional Secretariat conducted those cleaning projects before repairs are started.